Staci and I always talked about how Oklahoma was one place that we’d never live. Shows how much we know. Our move to Moore has been an interesting one to say the least. Of course there has been the chaos that the tornados have caused here in recent weeks. But it’s more than that. We’re still waiting for our house in Wichita Falls to sell. And we can’t afford to pay for another place to live in the meantime since, you know, we’re minsters and all. So instead of making a move into our own place, we moved in with Trevor & Brittany. That’s right – 8 people, 4 kids – all in a 3 bedroom home. Several people have questioned the sanity of everyone involved. After a full week into this crazy idea, I think I can sum up the experience in one word: wonderful. Which on the surface, makes no sense at all. But last night as we sat around the table sharing a meal, all I could think about was how good this experience has been. And it’s caught me completely off guard. We learn early on that reliance on others is at times a necessity, but we certainly don’t seek it out. No one wants to be a mooch or a welfare case. We want to stand on our own feet, provide for ourselves and be independent. So I went into this situation trying to find a way to earn my keep. I’ve tried to do the dishes after every meal. To pick up the clutter at any opportunity. To keep the shared bathroom in some sort of order. Honestly, I’ve been tiptoeing around like I’m a bother. Because that’s what we’ve learned that we are when we’re relying on others. And this attitude has caused me to miss something very meaningful. Because there’s no way to make this situation equal. There’s no way to repay the debt of being welcomed into someone’s home as family with no strings attached. All the chores and the clean dishes in the world will never bridge that gap. There is a special grace and closeness that can only be felt when we drop the facade of independence and truly rely on one another. The room and the food and utilities that Trevor & Brittany have extended to us are amazing gifts. But the most amazing gift is that it is freely and happily given. To look into their eyes last night was to finally understand what they’ve been telling us all along – they want this. We are family. There is no debt here. We rely on each other. 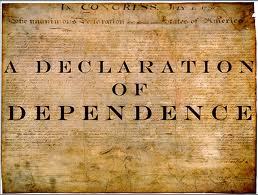 So today I’m declaring my dependence. I’m dropping the facade. Everything I have is a gift. I am standing on the shoulders of parents and siblings and brothers and teachers and coaches and friends. I live and breathe each moment by the grace of a God who calls me family. It is in him that I find my being. I am dependent. This does not take away from my being, it is what makes me whole. So I pray that you are able to look around you today and recognize your dependence on others. To see the way that you are connected to those around you. To take joy when others need you. Because a recognition of our dependence can be an incredibly freeing experience. This entry was posted in Ordinary Days and tagged Dependence, Humility, Reliance. Bookmark the permalink.